ACCESS AND PARKING: Open daily from dawn to dusk. Parking available on site. Winter: A variety of gulls frequents the beach, and waterfowl, such as mergansers, feed in the creeks and guts running through the marsh. Make sure to look for raptors perched on the snags along the road and winter sparrows in the tall grass and brush. 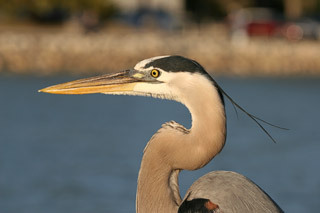 Spring: Spring is definitely the highlight of the birding season at Thompson’s Beach. The marsh teems with shorebirds, waders, and waterfowl and the road edges are alive with migrating warblers, sparrows and songbirds. Thompson’s Beach has been known to attract rare birds like White Pelicans, White Ibis and Marbled Godwit. Summer: The abundant gnats known as no-see-ums, along with mosquitoes and greenhead flies make a visit in summer very uncomfortable, especially on a still day. Those who venture out may be rewarded with a Peregrine Falcon sighting. Look and listen for nesting Seaside Sparrow, Willet, Glossy Ibis, Egret and Heron, and Clapper Rail. Fall: The raptor migration is the fall attraction at Thompson’s Beach and don’t forget to bird along the road edges for migrating passerines and the marsh for shorebirds and waterfowl. SITE DESCRIPTION: The viewing platform at Thompson’s Beach, a PSEG restoration site, offers an impressive vista of the vast expanse of salt marsh that is the Delaware Bayshore. It also provides a great vantage point from which to view foraging shorebirds such as Red Knot, Sanderling, Ruddy Turnstone, and Semipalmated Sandpiper. Black-bellied Plover, Short-billed Dowitcher, Dunlin and yellowlegs all feeding on the mudflats leading out to the beach. The remains of what used to be Thompson’s Beach Road are now essentially impassable; any attempt to reach the beach along this old dike road is not advisable PSEG and members of the community are working to restore access to the beach in the coming years. Osprey, Clapper Rail and Seaside Sparrow nest along Thompson’s Beach Rd., and Peregrine Falcon have been seen here as well. DON'T MISS: the sound of the Clapper Rail throughout the marsh. These birds are heard much more often than they are seen.